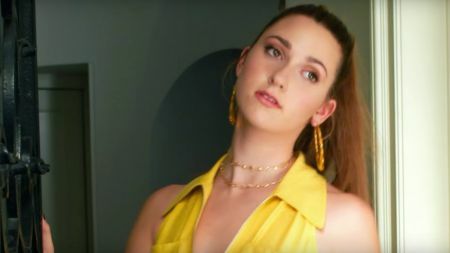 Teen pop artist Ashley Brinton has returned with a new single, this one taking her into the dance-pop genre for the first time. You can watch the music video for "Trouble" by playing the video above, stream the single now on Spotify, and download the single on iTunes. "Trouble" is Brinton's fourth single and first this year; she also released the songs "Slow Down" and "I Don't Wanna Lose Your Love" in 2017, while her debut single "All I Need" was released to iTunes in 2016. What was her intent with her latest single? "I wanted to share my emotions through this song," Brinton told AXS in an exclusive email statement. "It’s about choosing to be with someone that’s trouble for you and knowing it, but not being able to let go. It’s just trouble." That's a pretty straightforward track and a concept that we've heard before in many other pop songs. So what makes "Trouble" different and Ashley Brinton worth listening to? Still just 16 years old, Brinton is living in the very emotional space that she's singing about, able to relate to her themes of young love and decision-making, and therefore making those songs relatable to her audience. There's nothing too deep or overly complicated in "Trouble" when it's a universally accessible tune about something that many young music fans can grasp. Rather than reach for the stars, Brinton is comfortable in her own skin and her own voice and is using that to create songs that pop fans will enjoy while she continues to develop an as artist. It helps that "Trouble" is a dance single with a beat that will hook many listeners and bring them back for more. With four successful singles under her belt, Brinton is worth watching out for to see how she grows both vocally and creatively in 2018. Perhaps this single is another step toward a full album, as audiences are continuing to learn more about Ashley Brinton with every single. If she continues along this path, she could definitely be trouble herself and shake up the pop genre. Brinton does not currently have any tour dates scheduled, but fans can keep updated on announcements of future dates here. You can also watch Ashley Brinton's previous music video for "Slow Down." For more on Ashley Brinton, visit her official website.